The following story was written by Lena Kang, Knowledge Management Intern, GDPC, based on an interview with Wendy Brightman, ‎Regional Advisor for Cash Transfer Programming in Asia, Middle East, and Europe at American Red Cross. “When appropriate,” states Wendy, “cash programming allows beneficiaries to define and take charge of their own recovery. In disaster-affected areas with operating markets and available goods, a cash-based response provides beneficiaries with the freedom and flexibility to purchase basic and essential goods and services of their choice based on their self-determined priorities and needs rather than being restricted to ‘buckets and tents.’” On the islands of Leyte and Panay, Wendy and her colleagues had the combined target of distributing unconditional cash grants to 50,000 beneficiaries in four weeks –30,000 in Leyte and 20,000 in Panay. To date, this has been the Red Cross network’s largest and most ambitious cash transfer operation. During an unexpected scenario in Panay, cellular networks were down and people could not convert codes from their mobile phones into cash at kiosks. To honor its contract with the Red Cross, the cell phone company decided to distribute cash directly to people. To facilitate this process, Wendy worked alongside the PRC to address logistical, operational, and security challenges in order to set up cash distribution centers. Through problem-solving, coordination, and community organization, the team established distribution sites where organizers could transport large amounts of cash in satchels and then directly distribute the cash to several thousand beneficiaries. Four years earlier, the ARC went into Haiti immediately after the earthquake to implement a cash-transfer pilot program to target 1,500 households, with the broader aim of eventually reaching 40,000 to 50,000 households. In this case, the team spent up to four months on preparation work, including training, setting up delivery mechanisms, identifying and contracting a remittance company, and holding significant discussions within ARC. Much of the time was spent in contract negotiations and putting systems into place; however, the actual process of implementing the pilot program unfolded quickly and efficiently, meetings its target goal within two weeks. However, the idea of scaling up the program to target tens of thousands of beneficiaries was still relatively new and highly ambitious. 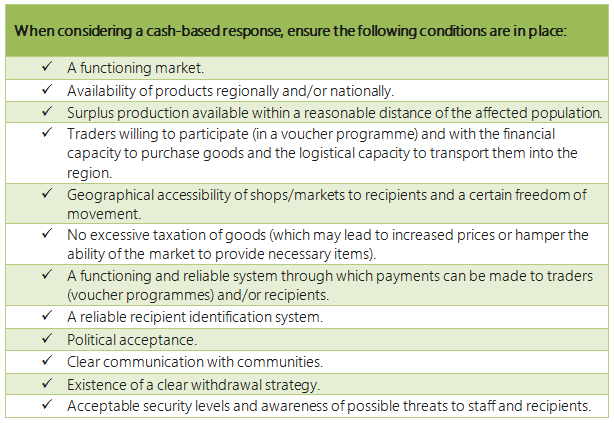 the different levels of preparedness among National Societies in cash operations. The Philippines Red Cross exemplifies the benefits of proactive cash preparedness. As part of contingency planning, the PRC team had received training to understand new tools in cash programming and had established pre-agreements with service providers before the crisis hit. PRC’s logistical preparedness measures, including pre-approved contracts with private sector partners, enabled the Red Cross to implement the cash transfer program quickly and efficiently. Integrating cash preparedness training into National Societies’ contingency planning can ensure that responders can start distributing cash to affected populations immediately after a crisis. Internal advocacy within senior leadership, as well as external outreach to National Societies, is a necessary process to increase support, raise awareness, and build mutual understanding between stakeholders.